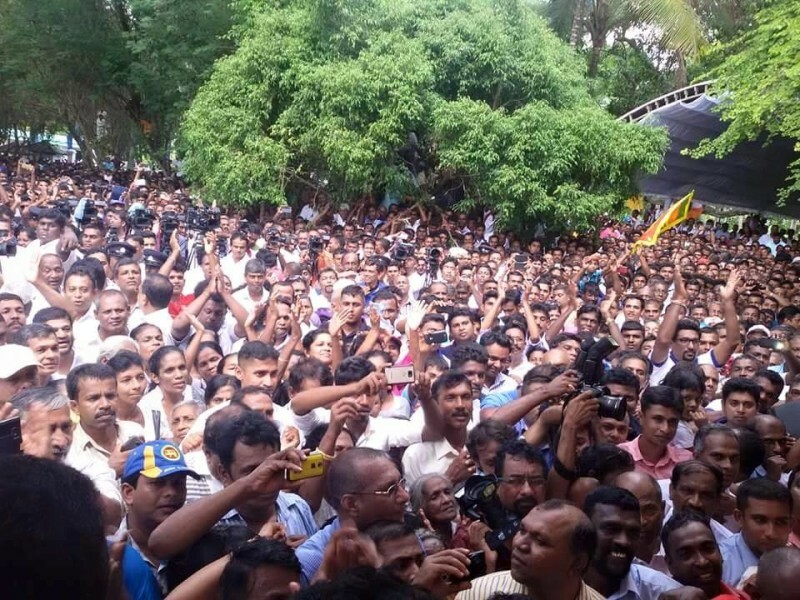 We will contest at the next General Election and form a new government, former President Mahinda Rajapaksa said at his home in Medamulana this morning (01). The fight that started in Nugegoda has become a major driving force in the country. I have no right to reject the request by people to protect the country and the party. The economic progress that has been stalled will be rebuilt and reenergized,” Rajapaksa said. The young generation of this country has not yet witnessed the darker side of the United National Party (UNP). The younger generation doesn’t know how the UNP paved the way for the separatists before 12-years ago or how they acted during the 88-89 insurrection period,” he added. He also went into say that there is a clear threat to the national security. The cabinet approval has not been granted for a request to give compensations for terrorists,” he said, adding that the present government, however, has ignored those who sacrificed their lives or been disabled in service of the country. This would have been a world record, if the request was given the cabinet nod,” Rajapaksa pointed out. He also accused the present government of issuing some 27 license to import ethanol spirits within 100-days of time. We never ran in an unconstitutional manner. We respect the law and order of this country. But the present government even defames the judiciary,” Rajapaksa charged. තම නිවසට පැමිණ කල ආරාධනාව පිලිගෙන මැතිවරණයට තරඟ කරන බව හිටපු ජනාධිපති මහින්ද රාජපක්‍ෂ මහතා පවසයි. මැදමුලන පිහිටි ඒ මහතාගේ නිවසේ සිට ඔහු කියා සිටියේ සන්ධානයේ, ශ‍්‍රීලනිපයේ, එජාපයේ, ජවිපෙ ඇතුළු සියලුම පක්ෂවල දේශප්‍රේමී ජනතාවට තමා සමඟ අත්වැල් බැදගන්නා ලෙස ඉල්ලා සිටින බවයි. Mahinda, please keep your own identity. You are the only political leader we the ordinary Sri Lankans have. MS/RW/CBK all are pawns of Sri Lanka enemies. Maru sira shown rampaging catholic traitor chief gb rw is running the show by dissolving the parlliament. If the cope report debated in the parliament, it would have buried the Unpatriotic Party (UNP) forever. By saving catholic chief’s and his traitor party, maru sira has done a grave treacherous act! chief of police john run the show. Don’t forget soon after he became pm, catholic chief appointed a catholic chief to the army, catholic chief to the central bank! Traitor Sinhalese donkeys supporting these traitor lot don’t want to understand this simple truth. What more damage they have to do before you open your eyes Sinhalese donkeys to stop supporting these traitors? මහින්ද ඔබට අපේ ආචාරය. පලමුව වැඩිජාතිය වන සින්හලයින් එකමුතු කල යුතුය. සින්හල බොදු, කිතු හාමුස්ලිම් ජනතාව එකතුවූ වහාම ඉන්දියානු පරපෝසිතයින් ඉන්දියානු ජඩවාදය අතහැර දමනු ඇත. Mahinda Rajapakse : The Tried and TRUSTED leader ! Welcome back. All good wishes with you and your family, plus many millions of supporters, to bring peace and prosperity to all in Lanka. At this point in time, all leaders should get together to re-build the country together with MRs visionary leadership. MR was never vindictive, and his past record in politics shows his trustworthiness and statesmanship, not only toward Lanka but also toward the rest of the world. Guard him well, O Lanka ! this is a rare leader. We salute you for your brave decision to fight the foreign powers trying to gain the control over our country. I’m really impressed with your acceptance of wrongs during your time & the promise to rectify them & also your call to other parties to join you. This is the time to forget & forgive & to get all other forces be JHU,JVP,BBS or SF to join you. Fantastic words to hear from a great leader. Only solution to our problems is MR but you should not repeat the same with your teams.Be straight forward and take action when ever needed. We do not want Corrupt people,We dont want drug kings,We dont want anyone guilty of any crime. We need you as a fearless leader who can answer the so called International community and the enemies of this land. We need you back for peace,Development and security in this country. You are the only Sinhala Buddhist leader we have who actually loves our Motherland. We do not want Christian Gays to rule our paradise island. Everyone talk about Buddhism but no one has done a great service to our religion like you and your previous Govt. Only good thing UNP traitors did was reducing the Gas price nothing else. They are bogus,Liars,Cheaters and most of them are corrupt. No one should give their valuable vote to them because they will bring more misery and sad to the people of this country. Help Mahinda to bring prosperity and Development back to the country.Help to send UNP traitors home in the next General election. මහින්ද රතු නිවේදනය නිකුත් කලා. සිරා හොල්මන් වෙලා. Leela, not only Sirisena but the entire (so called ) international community. Now Mahinda faction must have a clear break away and contents with the rest of UPFA. True SLFPers should understand that the party is not run by grass root levels anymore and leave the party behind with a clear conscience. We will contest at the General Election, says Mahinda- Ok Mathaya what about you ? Can you say I will contest than I can go to sleep to get nightmare !! !